Supplied with the complete STOL CH 701 kit, the drawings are not just assembly instructions (as with most kits), but are detailed 11" x 17" CAD blueprints of the entire airframe assembly and individual parts, and come with an assembly manual. Photo Assembly Guides for the step-by-step assembly of the STOL CH 701 kit. Supplied with a serial number, you can actually build your own aircraft from "scratch" following the Drawings and Manuals. Scratch-builders can purchase any individual parts or components directly from Zenith Aircraft Company. If purchased separately, the cost of the drawings and manuals is deductible off the cost of the full kit. but it will also sell sub-kits, individual parts, or just the plans and builder's manual." 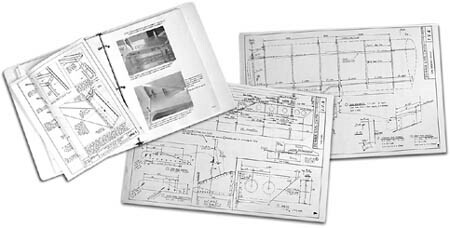 Click here for information on purchasing the STOL CH 701 Drawings and Manuals. Current Builders: Click here to update your existing drawings. The STOL CH 701 Drawings & Manuals package includes a CD-ROM with high-resolution Photo Assembly Guides for the assembly of the STOL CH 701 kit. CONSTRUCTION PHOTOS - Click here for the photos. Independently produced by an experienced STOL CH 701 builder, these videos (and more titles) from HomebuiltHELP.com are recommended time-savers to existing builders, and are an excellent resource to those considering to build their own airplane. HomebuiltHELP.com also offers other useful and informative titles. The Scratch Building Basics DVD covers many of the basic skills and tools you'll need to affordably build your own airframe from drawings only. "[Chris Heintz] designs have earned an excellent reputation among pilots, builders, and aviation authorities for their durable all-metal construction, normal flight characteristics, reliability, and low maintenance."